Monetary Transmission in India: Why is it important and why hasn’t it worked well? When I travel from my residence in Vile Parle (W) to the Reserve Bank of India Central Office in Fort, I pass each way Kenilworth – the birth place of late Homi Jehangir Bhabha. It is a good way to start and end the day, being reminded not just of his immense intellect but also of his deep sense of service to India. I am thus grateful to Professor Dipan Ghosh, who was the Dean of Students during my time at IIT Bombay, for inviting me to speak today in the Homi Bhabha Auditorium, and to Dr Subhendu Guha, for having endowed this lecture series at the Tata Institute of Fundamental Research (TIFR) in memory of his dear son, Aveek Guha. “Aveek,” a beautiful Bengali name meaning “fearless”, is exactly how all research needs to be, taking on seemingly insurmountable challenges, fighting it out with grit, and along the way, dissecting, reflecting, and distilling truth to its essence until it is unearthed in some recognizable form from beneath its scratchy exterior. The TIFR is a daunting proposition for any researcher to speak at. I hope that I can progress some way towards meeting its highest standards in the form of this talk, by raising an issue that is germane to all of us in today’s forum and that is worthy of being tackled in due course – that of, Monetary Transmission in India: Why is it important and why hasn’t it worked well? Let me start with some technical jargon and then explain from first principles the part of it I wish to focus on. With the amendment of the Reserve Bank of India Act in 2016, the “primary objective of the monetary policy is to maintain price stability while keeping in mind the objective of growth”. The Monetary Policy Committee (MPC) constituted under the amended RBI Act is mandated to determine the policy repo rate to achieve the specified medium-term inflation target of 4 per cent, within a band of +/- 2 per cent. For the Reserve Bank to achieve its mandate effectively, it is extremely important that an economic process referred to as “monetary transmission” works seamlessly. Any impediment to this process of monetary transmission hampers the achievement of our mandate. We, therefore, monitor and analyse monetary transmission on a regular basis, and undertake corrective steps to enhance its efficacy, if it seems broken or critically imperfect. What is monetary transmission? It is essentially the process through which the policy action of the central bank is transmitted to the ultimate objective of stable inflation and growth. The policy action consists typically of changing the interest rate at which it borrows or lends “reserves” (in our case, Rupees) on an overnight basis with commercial banks. In other words, monetary transmission is the entire process starting from the change in the policy rate by the central bank to various money market rates such as inter-bank lending rates, to bank deposit rates, to bank lending rates to households and firms, to government and corporate bond yields, and to asset prices such as stock prices and house prices, culminating in its impact on inflation and growth. The transmission mechanism hinges crucially on how monetary policy changes influence households’ and firms’ behaviour. This change can take place through several channels. Studying these channels is a vast subject in finance and economics literature. Therefore, given the time constraint, I will only cover a few key aspects. I will then explain how and why monetary transmission has, and more importantly, has not, worked in India, and touch also briefly upon how we could improve it. Changes in the central bank’s policy rate impact the economy with lags through a variety of channels, the primary ones being (i) interest rate channel, (ii) credit channel, (iii) exchange rate channel, and (iv) asset price channel. Let us start with how the interest rate channel works. The immediate impact of a change in the monetary policy rate is on the short-term money market rates (such as call money rate, certificates of deposits, commercial papers, treasury bills), key financial markets (exchange rate, equity prices), and also on medium and long-term instruments (yields on dated government securities and corporate bonds). The impact is typically quick and broadly one-to-one from the policy rate to short-term money markets rates such as the call money rate which is the unsecured or uncollateralized inter-bank lending rate: A bank will be willing to part with its reserves overnight to another bank only if it earns at least the rate that it could earn by parking these funds with the central bank; and, if banks compete adequately for such lending, then the rate will in fact track closely the central bank’s policy rate. The impact of the policy rate on other market rates varies across tenors and instruments depending upon the liquidity conditions and other factors such as how interest rates vary at different maturities. In turn, the central bank’s changes in its policy rate are expected to impact the banks’ cost of funds, both the rates they would pay to depositors and the rates they would demand for making loans. For example, when a central bank reduces the policy repo rate with the intention to support aggregate demand in the economy, the expectation is that there would be a reduction in the banks’ cost of funds and lending rates, and in the spectrum of market interest rates (and vice versa when the policy rate is increased). Lower lending interest rates of banks provide a boost to demand for bank credit from various segments of the society, for instance, from individuals and households for loans for consumer durables (such as automobiles) and for housing; and from entrepreneurs for new or increased investment in plant and machinery. An increased demand for automobiles, housing, and machinery generates increased demand for the inputs including labour in these industries, and hence, an increase in overall demand, incomes, and output in the economy. As this process continues, it eventually puts upward pressure on wages of labor and prices of inputs, and this way, raises inflation. A central bank mandated to maintain stable prices while taking account of growth thus faces a trade-off while lowering or raising its policy rate. The implicit assumption here is that bank balance sheets are strong and in a position to step-up quickly the supply of credit in response to lower funding cost and higher demand for credit – the bank lending or the credit channel of transmission. Cross-country evidence indicates that monetary transmission is greatly hindered if bank balance sheets are weak in that they do not have much loss-absorption capacity to deal squarely with their problem loans – indeed, the evidence suggests that there might be ever-greening of bad loans, and increased ‘zombie’ lending, lending to distressed firms at subsidized rates to kick the can of loan defaults down the road, resulting in misallocation of resources, productivity losses and weak growth. This way, attempts to stimulate growth with aggressive policy rate cuts when there are bank balance-sheet problems get wasted and can even backfire in the form of mal-investments, creating false hopes of a growth boost and relaxing the pedal on deeper balance-sheet and structural reforms of the banking sector.1 The effectiveness of this bank credit channel is a critical issue in the current juncture in India to which I will come back later. Lower interest rates also boost asset prices such as housing and equity prices as these can now be purchased at cheaper borrowing costs. The resulting boost to household / corporate wealth and improved cash flows on the back of lower interest rates also add to the demand impulses. This is the asset price channel of monetary transmission. Higher asset prices can enhance the value of the collateral or net worth of the borrowers, interacting with the bank lending or credit channel, enhancing the capacity to borrow more and at competitive rates, reinforcing the impulses to aggregate demand. Finally, lower domestic interest rates could lead to a depreciation of the domestic currency, on the one hand making exports more competitive in the global market and adding to domestic demand and economic activity, but on the other hand, could also have a direct upward impact on the domestic currency prices of imported inputs, making imports (for example, crude oil) costlier. This is the exchange rate channel of transmission. All the channels that I have described above – the interest rate channel, the bank lending or credit channel, the asset price channel, and the exchange rate channel – are not stand alone channels; rather, these work at the same time, and may reinforce or interact with each other, so that their individual impact is difficult to disentangle. It also needs to be recognised that the transmission mechanism is complex. The speed and strength at which the central bank’s policy rate changes travel to the rest of the economy could vary widely from country to country depending on the structure of the economy and the state of its financial system. The available empirical evidence for India suggests that monetary policy actions are felt with a lag of 2-3 quarters on output and with a lag of 3-4 quarters on inflation, and the impact persists for 8-12 quarters. Among the channels of transmission, the interest rate channel has been found to be the strongest.2 Given that monetary policy impacts output and inflation with long (and often variable) lags, it is critical for monetary policy actions to be forward-looking, i.e., monetary policy needs to respond to expected output and inflation developments. Of course, the expected evolution of output and inflation is uncertain, thereby rendering the transmission analysis even more challenging, adding to the complexity of the central bank’s decision-making (and creating exciting opportunities for its critiques!). The key point is that if parts of the transmission machinery are broken, then monetary policy would be less effective. The Indian financial system remains bank-dominated, though the share of non-bank finance companies (NBFCs) and markets (corporate bonds, commercial paper, equity, etc.) in overall financing of the economy is steadily rising. Hence, the overall efficacy of monetary transmission in India hinges critically on the extent and the pace with which banks, taking a cue from – and induced by – the changes in the policy repo rate, adjust their deposit and lending rates and meet adequately the economy’s demand for credit. Overall, data suggests that the pass-through from policy rate changes to bank lending rates has been slow and muted. This lack of adequate monetary transmission remains a key policy concern for the Reserve Bank as it blunts the impact of its policy changes on economic activity and inflation. Since the deregulation of interest rates in the early 1990s, the Reserve Bank has made several attempts to improve the speed and extent of the monetary pass-through by refining the process of setting lending interest rates by banks, while at the same time imparting transparency to borrowers and flexibility to banks in the process of interest rate setting. We have transited from the prime lending rate (PLR) system (1994) to the benchmark prime lending rate (BPLR) system (2003), the base rate system (2010), and the present marginal cost of funds based lending rate (MCLR) system (2016). Let me explain these interest rate setting regimes briefly, before I turn to an assessment of the performance of the (legacy) Base Rate and (prevalent) MCLR systems. In India, as in a number of other countries, a large proportion of loans is at floating rates, i.e., the interest rate charged to the borrower keeps changing depending on the reset periodicity. The floating rate is linked to some “benchmark rate” (which ideally varies over time in consonance with the changing macroeconomic and financial conditions and, in particular, the central bank’s policy rate). Banks also charge a spread over the benchmark to factor in term premia and credit risk, among other factors. The actual lending rate is the benchmark plus the spread. The benchmark could be internal or external; an internal benchmark will be based on elements which are in part under the control of the bank such as cost of funds, while an external benchmark is outside the control of the bank (for example, it could be market determined rate such as Certificate of Deposit rate or Treasury Bill rate or Inter-Bank Offer Rate, or it could simply be the central bank’s policy rate). The virtue of an external benchmark is that it is transparent, common across banks, and borrowers can compare various loan offers by simply comparing spreads over the benchmark (all else, such as maturity of the loan, being equal). As market rates normally move in line with the central bank’s policy rate, an external benchmark is globally considered and adopted as more appropriate than an internal benchmark for transmitting monetary policy signals. In India, the Reserve Bank has provided the banks flexibility to use both the internal and external benchmarks, but the banks seem to have preferred internal benchmarks over external benchmarks on two key grounds: first, the internal benchmark reflects their cost of funds, and second, it has been perceived that there have not been until recently any robust and vibrant external benchmarks. In October 1994, when the Reserve Bank deregulated lending rates for credit limits over ₹ 2 lakh, banks were required to declare their prime lending rates (PLR) - the interest rate charged for the most creditworthy borrowers - taking into account factors such as cost of funds and transaction costs. The PLR was, thus, expected to act as a floor for lending above ₹ 2 lakh. However, the experience with its working was not satisfactory mainly for two reasons: (i) both the PLR and the spread charged over the PLR varied widely, and inexplicably so, across banks; and perhaps more importantly, (ii) the PLRs of banks were rigid and inflexible in relation to the overall direction of interest rates in the economy. In view of these concerns, the Reserve Bank advised banks in April 2003 to announce Benchmark PLRs (BPLRs), taking into account the cost of funds, operational costs, minimum margin to cover regulatory requirements (provisioning and capital charge), and profit margin. The BPLR system also fell short of its desired objective of enhancing transparency and serving as the reference rate for pricing of loan products, with a large part of the lending taking place at interest rates below the announced BPLRs. The share of sub-BPLR lending was as high as 77 per cent in September 2008, rendering it difficult to assess the transmission of policy rate changes of the Reserve Bank to lending rates of banks. The residential housing loans and the consumer durable loans were outside the purview of the BPLR. As such, sub-BPLR lending became a major distortion in terms of cross-subsidisation across borrower categories. Next, the drawbacks of the BPLR system led to the introduction of the base rate system in July 2010. The base rate was also based, inter alia, on the costs of borrowed funds; an indicative formula for arriving at the base rate was also provided. The base rate was to be the minimum rate for all loans (except for some specified categories) with the actual lending rate charged to the borrowers being the base rate plus borrower-specific charge or spread. In practice, the flexibility accorded to banks in the determination of cost of funds – average, marginal or blended cost – caused opacity in the determination of lending rates by banks and clouded an accurate assessment of the speed and strength of the transmission. Moreover, banks often adjusted the spread over the base rate to benefit the new borrowers while leaving the transmission through the base rate weak for existing borrowers. 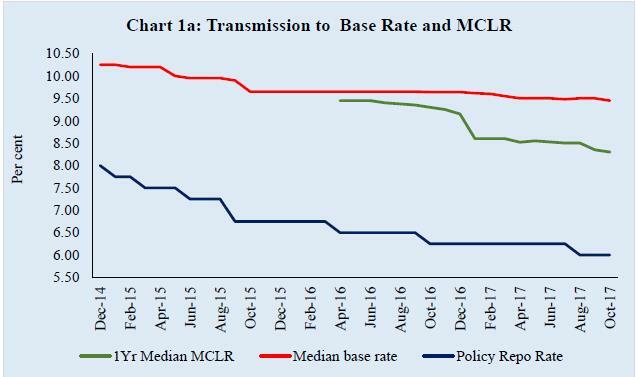 The weaknesses and rigidities observed with the transmission under the base rate system led to the present system, i.e., the MCLR system effective April 1, 2016. With banks required to determine their benchmark lending rates taking into account the marginal cost of funds [unlike the base rate system where banks had the discretion to choose between the average cost or the marginal cost (or blended cost) of funds], lending rates were expected to be more sensitive to the changes in the policy rate under the MCLR system vis-à-vis its predecessor (the base rate). The actual lending rate is based on MCLR plus a spread (business strategy and credit risk premium). The base rate system was allowed to be in operation concomitantly for the loans already contracted, pending their maturity or a shift to the MCLR system at mutually agreeable terms between the bank and the borrower. has been slow and incomplete under both the base rate and the MCLR systems, although it has improved since November 2016 under the pressure of large surplus liquidity in the system post demonetisation (Table 1). was significant on fresh loans, but muted for outstanding loans (base rate and MCLR). was uneven across borrowing categories. WADTDR: Weighted Average Domestic Term Deposit Rate. WALR: Weighted Average Lending Rate. MCLR: Marginal Cost of Funds based Lending Rate. *: MCLR system was put in place in April 2016. Latest data for WALRs and WADTDR pertain to September 2017. What explains the slow and incomplete pass-through from the policy rate changes to the lending rates? Two broad factors have dampened transmission to the lending rates. Second, spreads charged by banks over MCLR were adjusted to offset the changes in MCLR, thereby impacting the overall reduction in lending rates. 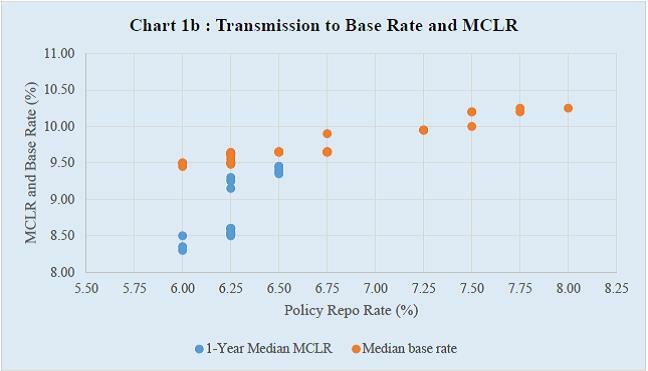 The spread over the MCLR could vary from bank to bank due to idiosyncratic factors. However, as the Study Group observed, banks adjusted the spread over the MCLR arbitrarily in several ways and the variations in the spreads across banks appeared too large to be explained based on bank-level business strategy and borrower-level credit risk.5 The Study Group also observed that while the spread over the MCLR was expected to play only a small role in determining the lending rates by banks, it has turned out to be the key element in deciding the overall lending rates. What explains the muted pass-through from policy rate to bank lending rates, either by banks not changing the benchmark rate or by adjusting the spread? One plausible underlying reason is the rate rigidity on the liability side of banks caused by several factors. In India, about 90 per cent of total liabilities of banks are in the form of deposits. Bank deposits are predominantly at fixed interest rates, thereby imparting rigidity to the transmission process. Further, over 36 per cent of term deposits of banks have maturity of three years and above (Table-2), implying their rates get reset infrequently and with significant lags to policy rate changes. While the banks’ marginal cost of funds may drop quickly with a cut in fresh deposit rates, the average cost of deposits comes down rather slowly, which weakens the transmission, especially in the case of the base rate system. Source: Handbook of Statistics on the Indian Economy, RBI. What is often not recognised is the large access our banks have to low cost Current and Savings Account (CASA) funds. CASA funds constitute about 40 per cent of aggregate bank deposits with the share of saving deposits at around 31 per cent. Importantly, banks are free to decide saving deposit interest rates since October 2011, but until recently, most of the banks chose to leave the saving deposit rate unchanged, ignoring completely monetary policy signals. For instance, the major banks kept their saving deposit rate unchanged at 4 per cent between October 2011 and July 2017, even as the Reserve Bank’s policy rate moved significantly over this period from 8.5 per cent in October 2011 to 7.25 per cent in August 2013. It increased again to 8.0 per cent by January 2014, before declining to 6.0 per cent by August 2017. Furthermore, the deterioration in banking sector health due to worsening of asset quality over the past 2-3 years and the expected loan losses in credit portfolios also seem to have induced large variability in spreads in the pricing of assets. With under-capitalized banks aiming to protect their net interest margins6 (NIMs) – indeed, weak banks’ NIMs have remained broadly unchanged in the face of large stressed assets – so as to maintain profitability in the short-term even at the expense of long-term profits as well as deposits and lending shares, the transmission to lending rates has been severely impacted. In effect, there has been a cross-subsidisation of corporate loan losses by lending rates in healthier sectors such as in retail. Finally, the competition that banks face from alternative instruments of financial savings – such as mutual funds and small saving schemes – also seems to have made banks hesitant in varying the interest rates on term deposits in consonance with policy rate signals. Although bank deposits have some distinct advantages in the form of stable returns (vis-à-vis mutual fund schemes) and liquidity (vis-à-vis small saving schemes), bank deposits are in a disadvantageous position in terms of tax-adjusted returns in comparison with these schemes. All of these factors have imparted rigidity to the liability side of banks’ balance sheet with respect to policy rate changes, in turn inducing behaviour to make the rates on asset side of banks’ balance sheet rigid too. Drawing from its comprehensive analysis, the RBI’s Study Group has suggested a number of steps to enhance transparency and transmission from monetary policy signals to the actual lending rates. Their recommendations pertain to improving transmission based on the existing lending rate system as well as a fundamental reform of the interest rate setting process. Let me touch upon the four major recommendation by the Study Group. In view of the less than desired transmission and transparency under the internal benchmark based lending rate systems – PLR, BPLR, base rate and MCLR – so far, the Study Group has recommended that there is need to shift to an external benchmark based lending rate system. The internal benchmark-based pricing regimes are not in sync with global practices on pricing of bank loans. Given the scope of arbitrariness under the MCLR system, the Study Group has recommended that the switchover to an external benchmark needs to be pursued in a time-bound manner. While recognising that no external instrument in India meets all the requirements of an ideal benchmark, and after analysing the pros and cons of 13 possible candidates, the Study Group has recommended that the Treasury Bill rate, the Certificate of Deposit (CD) rate, and the Reserve Bank of India’s policy repo rate are better suited than other interest rates to serve the role of an external benchmark. The Study Group has recommended that all floating rate loans extended beginning April 1, 2018 could be referenced to one of the three external benchmarks selected by the Reserve Bank after receiving and evaluating the feedback from stakeholders. Second, the Study Group has recommended that the decision on the spread over the external benchmark could be left to the commercial judgment of banks, with the spread remaining fixed all through the term of the loan, unless there is a credit event (as per standardized or ex ante mutually agreed definition of “credit event”). Third, the periodicity of resetting the interest rates by banks on all floating rate loans, retail as well as corporate, be reduced from once in a year to once in a quarter to expedite the pass-through from the monetary policy signal to the actual lending rates. Fourth, to reduce rigidity on liabilities side, banks be encouraged to accept deposits, especially bulk deposits, at floating rates linked directly to the selected external benchmark. The common theme underlying these recommendations is to improve monetary transmission by ensuring that changes in the policy rate transmit quickly and adequately to banks’ lending rates in a transparent manner without any cross-subsidisation and discrimination between existing and new borrowers. The idea is also to make banks’ liability side more flexible so that the objectives of improving monetary transmission by the Reserve Bank and maintaining healthy net interest rate margins by banks are aligned. The report of the Study Group, which was put in the public domain on October 4, 2017 has generated much interest and extensive feedback to the Reserve Bank from all stakeholders, not only banks, but also general public and media. We have received a number of useful suggestions and comments on the recommendations of the Study Group. These are being examined carefully and would help us to take a considered view, factoring in transition costs and providing a calibrated path to the desired benchmarking system. As explained earlier, even as the Reserve Bank has reduced its policy repo rate by 50 bps since October 2016 and by a cumulative 200 bps since December 2014, the banking sector’s credit growth has remained much muted. While weak demand for bank credit could be one of the factors leading to the observed slowdown in credit growth, a primary cause of the slowdown had also been the weak balance sheets of public sector banks in view of large non-performing assets which seem to have made banks risk averse and induced them to reduce the supply of credit: under-capitalized banks have capital only to survive, not to grow7. The dominance of the supply side factor has also been borne out by the fact that the credit growth of private sector banks (better asset quality and well-capitalised on average) remains robust, whereas there has been a sharp deceleration in the credit growth of public sector banks (especially the ones with high stressed assets). Against this backdrop, the enactment of the Insolvency and Bankruptcy Code (IBC) in December 2016, the promulgation of the Banking Regulation (Amendment) Ordinance 2017 (since notified as an Act), and the subsequent actions taken thereunder in the form of the Reserve Bank requiring banks refer the largest, material and aged non-performing assets (NPAs) to the IBC, have made the IBC a lynchpin of the new time-bound resolution framework for bank NPAs. These initiatives will now be supported by the Government’s decision to recapitalise public sector banks in a front-loaded manner, with a total allocation of ₹ 2.1 trillion, comprising budgetary provisions (₹ 181 billion), recapitalisation bonds (₹ 1.35 trillion), and raising of capital by banks from the market while diluting government equity share (around ₹ 580 billion). The two steps together – asset resolution and bank recapitalisation – are expected to strengthen bank balance sheets significantly and improve banks’ ability and willingness to lend at rates in consonance with policy rates and result in an improved monetary transmission. In summary, efficient monetary transmission is a sine qua non for the successful pursuit of its objectives by any central bank. Over the past two decades, it has been the endeavour of the Reserve Bank to strengthen the monetary transmission process, but these efforts have yet not yielded the desired results. The transmission from the policy repo rate to bank lending rates, which is the dominant transmission channel in India, has remained a matter of concern. With the recent explicit objective of price stability mandated by the legislature, the issue of smooth monetary transmission has assumed an added significance. Against this backdrop, we have recently put out a report by the Internal Study Group to address the weaknesses of the existing monetary transmission system. A key suggestion before us is to whether to shift the loan pricing system from an internal benchmark to an external benchmark. The Reserve Bank will take a considered view in the matter at an appropriate time. In my view, there is a deeper economic issue at hand in the recommendation to move towards an external benchmark. The issue is: who should bear the interest rate risk in the economy – the borrower, or the depositor, or the bank? Who is likely to be better at managing the interest rate risk? Retail depositors and borrowers are unlikely to have efficient tools to manage the interest rate risk. Banks, however, should have the wherewithal to manage interest rate risk. Similarly, bulk depositors and large corporate borrowers can also be expected to be in a position to manage the interest rate risk. Non-bank financial institutions with less exposure to interest rate risk, such as insurance and pension funds, could also be good repositories of this risk. Foreign banks may be able to offset interest rate risk globally. A combination of interest-rate risk transfer mechanisms through market products such as interest-rate derivatives (swaps, in particular) and securitized products such as collateralized loan obligations (CLOs) will spring about, provided banks indeed have to manage the interest rate risk rather than have it as a matter of convenience to pass it onto borrowers. Hopefully, I will focus sometime soon on these issues in a companion piece - Monetary Transmission in India: How can it be improved? 1Acharya, V.V., T. Eisert, C. Eufinger, and C.W. Hirsch (2016), ‘Whatever it Takes: The Real Effects of Unconventional Monetary Policy’, Working Paper, New York University Stern School of Business. 2Report of the Expert Committee to Revise and Strengthen the Monetary Policy Framework (Chairman: Urjit R. Patel), 2014, Reserve Bank of India. The lags of 2-4 quarters that I just noted are the average lags over the sample periods of various studies, and the actual lags at any given point of time could be vastly different from these average lags, depending upon factors such as the stage of the domestic and the global business cycle, the domestic liquidity and financial conditions, the fiscal stance, the health of the domestic banking sector and the non-banking sector. 4The ad hoc adjustments included, inter alia, (i) inappropriate calculation of the cost of funds; (ii) no change in the base rate even as the cost of deposits declined significantly; (iii) sharp increase in the return on net worth out of tune with past track record or future prospects to offset the impact of reduction in the cost of deposits on the lending rate; and (iv) inclusion of new components in the base rate formula to adjust the rate to a desired level. The slow transmission to the base rate loan portfolio was further accentuated by the long (annual) reset periods. 5For example, the Study Group found that: (i) large reduction in MCLR was partly offset by some banks by a simultaneous increase in the spread in the form of business strategy premium ostensibly to reduce the pass-through to lending rates; (ii) there was no documentation of the rationale for fixing business strategy premium for various sectors; (iii) many banks did not have a board approved policy for working out the components of spread charged to a customer; (iv) some banks did not have any methodology for computing the spread, which was merely treated as a residual arrived at by deducting the MCLR from the actual prevailing lending rate; and (v) the credit risk element was not applied based on the credit rating of the borrower concerned, but on the historically observed probability of default (PD) and loss given default (LGD) of the credit portfolio/sector concerned. 6Net interest margin is defined as the difference between a bank’s interest income (on its loans and assets) less its interest expenditure (on its deposits and other borrowings). 7Acharya, Viral V (2017), “The Unfinished Agenda: Restoring Public Sector Bank Health in India”, 8th R K Talwar Memorial Lecture.